Eating is perhaps the piece to the health puzzle that causes the most frustration. We are inundated with food everywhere we go and with different ways to approach it. And let’s face it–the things we ate when we were younger, we just can’t get away with as we age. Old habits die hard. I want to help you have a healthy relationship with food. To know that it’s something that fuels our body, but also something God has created for enjoyment! 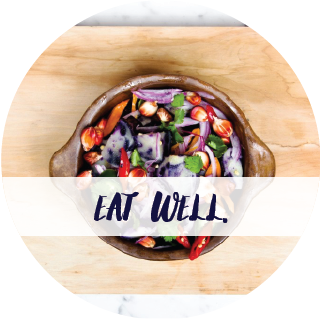 I want to help you not just eat, but eat well.